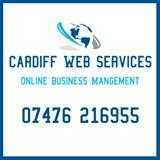 I run many businesses throughout the Cardiff and Vale areas. We differ from the rest, offering a complete package, including creation or management of your Website, it's SEO, advertising, marketing and Social Media. Not only will we get your Website ranking high organically, but we will personally get you leads/sales. If you take out a SEO package, your website will be HALF PRICE!! !